For four decades, Ron Elgin was involved in the world of advertising. He began as an intern for Cole & Weber, then worked as a copywriter before switching to the account side of that agency. His next step would transform the Seattle advertising community forever. In 1981, Ron joined with Dave Syferd to create a different kind of agency–one without boundaries, where each communication discipline would have an equal voice in helping solve business problems. That agency grew from the market’s smallest to the largest and became a true national player as DDB Seattle. Right from the beginning, Ron was smart enough to understand that he needed to hire people who were, as he’d put it, “smarter than me.” But that wasn’t enough. Because he wanted to give those smart people a great place to work, he instituted a strict “No Assholes Allowed” policy. Ron set a high standard for the work they did, but he did not micromanage. He let his people run the show, even when it made him uncomfortable–which it often did. They were challenged to take risks and given “the freedom to fail.” It paid off. As Ron became an ambassador for the Seattle advertising community, he also found time to sit on countless charitable, cultural and civic boards. Giving back was just part of Ron’s DNA, and it soon became part of his agency’s DNA. The agency’s Charity Golf Classic, an indoor competition served for 20 years as the ad community’s cornerstone fundraising event in support of children’s charities. The agency did good work, as in work for the greater good. Even after stepping down from DDB, Ron’s still not done. He created a marketing consulting firm, re:connects, sits on several boards for both established and startup companies, and in all his spare time, Ron wrote Huckster. 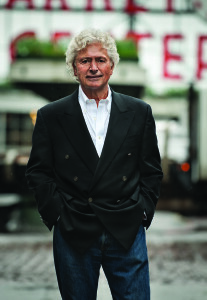 Ron Elgin is one of the few to reach Seattle Advertising Icon status receiving the Silver Medal Award by the American Advertising Federation in 2012. He’s enormously proud that his legacy includes building an award winning agency that became the market leader and reinforced Seattle’s image as a national player paving the way for so many others to carry that torch even further.